Music. It's something that I love. I love creating, arranging (the little that I've done), performing (when it's over), and sharing. I love it so much that I want to make a career of it. I'm going to become a music teacher... Eventually. After my bazillion years of university are over. I want to share my passion and my joy with young people. I want to teach them why music and the arts are so important to society. I want to help infuse them with a desire to create good art. To achieve these goals, I'll be taking lots of classes and credit hours relating to music. I've also invested a lot of time and money in attending conferences, workshops, and conventions which will help me develop my skills. I've had the opportunity already to attend one conference last February and I'm going to more in the coming months. I'll have (or had) the opportunity to work with and learn from legends such as Ron Staheli, Rosalind Hall, Terry Durbin, Philip Baldwin, Jack Ashton, Reed Criddle, Mark Henderson (who I couldn't find a bio for. He's currently up at Weber State) and Mack Wilburg just to name a few. I'm also involved in the community by participating in the Orchestra of Southern Utah and the Peter Street fiddle ensemble (even though my emphasis is choral, it's still good experience). I also volunteer in a fourth grade class at my own elementary alma mater. It's not secondary education (which is what my degree is towards) but it is experience in a classroom. And I love it. I was also hired on as the assistant director of the Southern Utah Suzuki Strings Youth Orchestra. It doesn't pay much, but it will provide invaluable experience and look really good on a résumé. That last little bit is what I was building up to. I am really excited and honored that Sara, one of my past violin instructors and the director of the youth orchestra, would approach me and offer this position. I'm a little bit nervous because I have to memorize a lot of music for it and that doesn't come easily to me (or maybe it does come easily. It has been years since I've memorized music), and I'm sure there are many other things contributing to my nervousness. I just need to have confidence. It's not very good quality, but I feel like it describes my feelings right now. Capitol Heights area, April 2011. I stole this photo from Facebook from Sister Walters. Every transfer cycle (6 weeks), we would have apartment inspections. Elder and Sister Walters did this one and asked us for a picture with Flat Alyssa (like Flat Stanley) for a niece/granddaughter's school project. 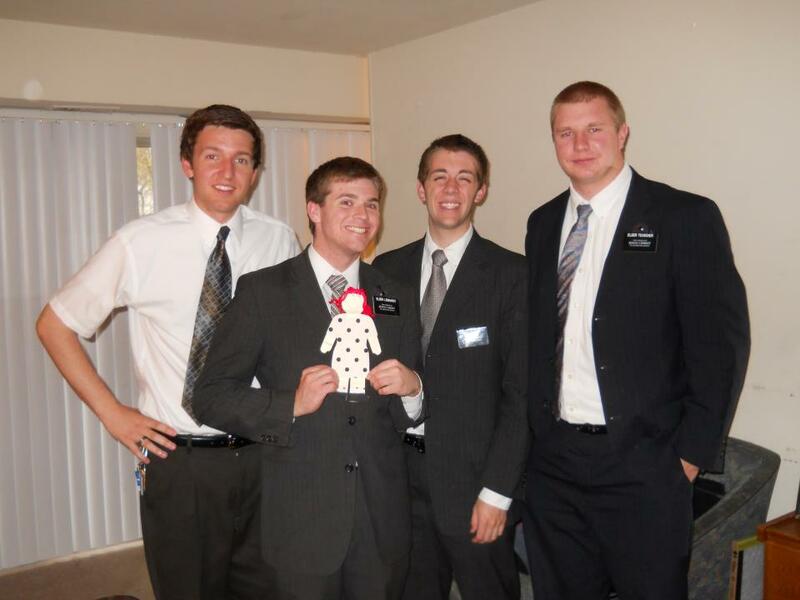 LtoR: Elders Eric M, me, Matthew P, and Taylor T.
I love Reading your blog :) Miss you!